12.5" RCOS @ ~f/9 (2880 mm fl) 0.64 arcsec / pixel. The Zoomify image scale is 1.28 to 3.20 arcsec / pixel. eXcalibrator 2.0-Beta for (b-v), (v-r) color calibration, using 8 stars from the NOMAD1 database. CCDStack to calibrate, register, normalize, data reject, combine the sub exposures and create the LRGB image. North at about 4:00 o'clock., the image is rotated 135° clockwise. IC 405 (also known as the Flaming Star Nebula, SH 2-229, or Caldwell 31) is an emission/reflection nebula in the constellation Auriga, about 1,500 light-years from Earth. The rippling dust and gas lanes surround the star AE Aurigae and give the impression that the star is aflame... hence the nebula's popular name. 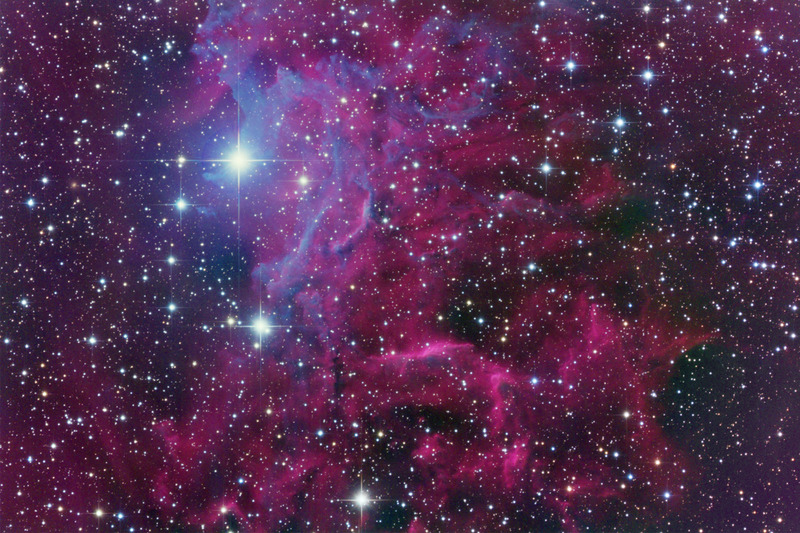 The star, AE Aurigae, creates the red glow by energizing the nebula's hydrogen. The blush areas are created by dust that scatters and reflects the stars blue light.